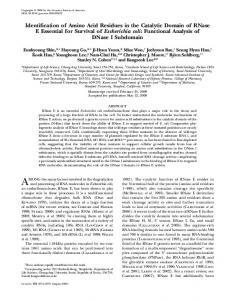 molecules, demonstrating the role of the DNase I domain in RNase E activity. (14), 5S rRNA (13) and 16S rRNA (28, 53). 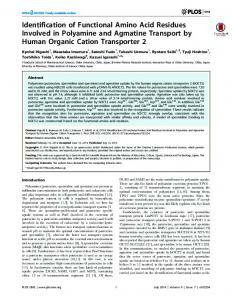 N-terminal half (amino acid residues 1-498) is sufficient for cell survival (19, 43). rne gene under the control of an arabinose-inducible promoter (pBAD-RNE) (23). phylogenetically diverse bacterial species (Table 1). concentration at least 10-20% of normal (15). in copy number do linearly reflect the extent of decrease in RNase E activity. proteins did not result in shift of any bands (lane 3 in supplementary Fig 1S). although the yield was much less than that for the wild type enzyme (Fig 5A and B). 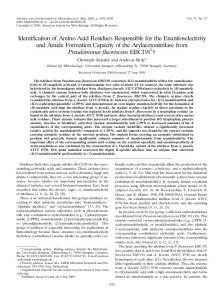 no significant collapse or misfolding of the mutant protein. 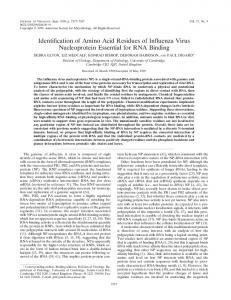 poorly) and show in vitro ribonucleolytic activity at high substrate concentrations. 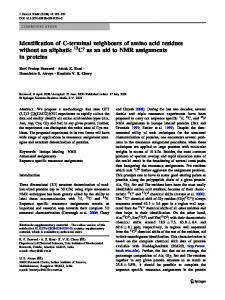 proteins to a degree that was not detected by CD analysis is the basis for the phenotype. GAATTGTGAGCGGATAAC-3’) and Nrne 3’ (5’-CTACCATCGGCGCTACGT-3’). 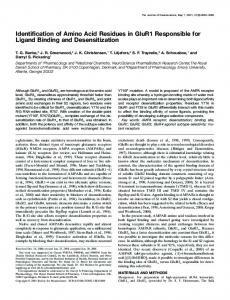 cleavage assay, and Northern blot analysis were performed as described previously (25). the intensity of each band was quantitated using OptiQuant™. 000-10293-0) to K. Lee and Y. Lee, and NIH (AI08619) to S. N. Cohen. coli ribonuclease E dominant-negative mutants. Genetics 172:7-15. 2. Callaghan, A. J., M. J. Marcaida, J. 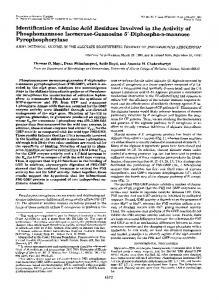 A. Stead, K. J. McDowall, W. G. Scott, and B. F.
for RNA turnover. Nature 437:1187-1191. 3. Carpousis, A. J., G. V. Houwe, C. Ehretsmann, and H. M. Krisch. 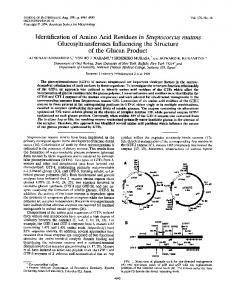 1994.
between two enzymes important in RNA processing and degradation. Cell 76: 889-900.
degrading machine assembled on RNase E. Annu. Rev. Microbiol. 61: 71-87. 5. Casarégola, S., A. Jacq, D. Laoudj, G. McGurk, S. Margarson, M. Tempête, V.
kDa protein. J. Mol. Biol. 228: 30-40.
domain required for tetramer formation. J. Biol. Chem. 281: 27046-27051.
an old problem with some new twists. Prog. Nucleic Acid Res. Mol. Biol. 62: 55-108. RNase E gene expression. Genes Dev. 14:1249-1260.
on the surface of an RNA-binding domain are crucial for RNase E function. Mol. molecular for the RNA moiety of the processing enzyme RNase P. Proc. Natl. Acad. Escherichia coli. Mol. Microbiol. 43: 1053-1064. RNase G by 5'-monophosphorylated RNA. Proc. Natl. Acad. Sci. 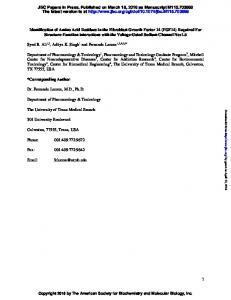 USA 101: 9211-9216.
using a novel oligonucleotide-based assay. Nucleic Acids Res. 31: 4710-4716.
protein S1 as a poly(A) binding protein in Escherichia coli. Biochimie 79: 493-502. Escherichia coli. J. Bacteriol. 178: 3917-3925.
second-site revertants. 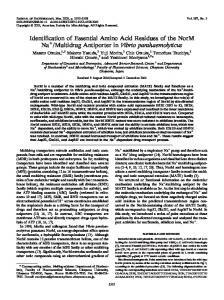 The Korean Journal of Microbiology 42: 156-159. Escherichia coli RNase P. J. Biol. Chem. 271: 19330-19337. RNA and protein. Proc. Natl. Acad. Sci. USA 76: 3795-3799.
null mutation identifies functional interrelationships with RNase E in Escherichia coli. Escherichia coli RNase E shows shuffling of catalytic and PNPase-binding domains. 25. Lee, K., X. Zhan, J. Gao, J. Qiu, Y. Feng, R. Meganathan, S. N. Cohen, and G.
RNA abundance in E. coli. Cell 114: 623-634.
ribosome-free mRNA. Mol. Microbiol. 45: 1231-1243.
of Escherichia coli tRNA precursors. RNA 8: 97-109.
are both required for the 5' maturation of 16S ribosomal RNA. EMBO J. 18: 2878-2885.
cleavages of RNA I encoded by the pBR322 plasmid. J. Biol. Chem. 269: 10797-10803.
maturation of ssrA RNA and normal ssrA RNA peptide-tagging activity. Proc. Natl. Acad. Sci. 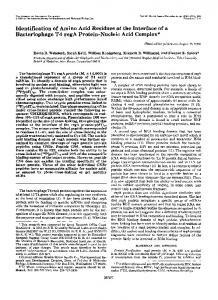 USA 96: 12406-12411.
associated with the cytoplasmic membrane via the N-terminal region of ribonuclease E.
Proc. Natl. Acad. Sci. USA 98: 63-68.
in vitro. J. Mol. Biol. 234: 998-1012.
regulatory RNA and its mRNA targets in Escherichia coli. Genes Dev. 17: 2374-2383.
particular nucleotide order determines the specificity of RNase E cleavage. J. Biol. 37. McDowall, K. J., Kaberdin, V. R., Wu, S. W., Cohen, S. N. and Lin-Chao, S. 1995. Site-specific RNase E cleavage of oligonucleotides and inhibition by stem-loops. binding motif. J. Mol. Biol. 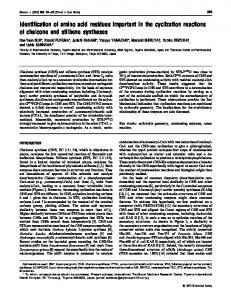 255: 349-355.
the regulation of stability of E. coli ompA mRNA. Cell 52: 893-901.
with RNase E in a multicomponent ribonucleolytic complex. Proc. Natl. Acad. Sci. RNAs. Genes Dev. 19: 2176-2186.
strain with a longer chemical lifetime of messenger RNA. J. Mol. Biol. 129: 343-357.
processing in Escherichia coli in the absence of RNase E-based degradosome assembly. essential for cell viability in E. coli. Genes Dev. 16: 1102-1115.
helicase in the Escherichia coli RNA degradosome. Nature 381: 169-172.
interaction with proteins involved in mRNA degradation. Mol. Microbiol. 32: 765-775. 47. Reed, R. E., M. F. Baer, C. Guerrier-Takada, H. Donis-Keller, and S. Altman. 1982. P from Escherichia coli. Cell 30: 627-636.
identification of its oligonucleotide-binding and dimerization interfaces. J. Mol. Biol. 50. 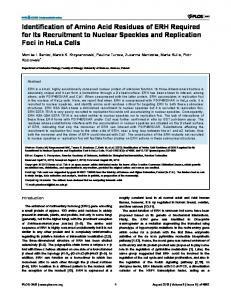 Tamura, M., K. Lee, C. A. Miller, C. J. Moore, Y. Shirako, M. Kobayashi, and S. N.
nonfilamentous growth of Escherichia coli cells but not for colony-forming ability. 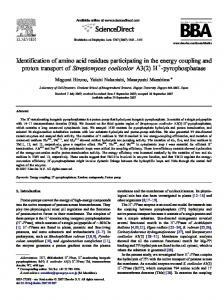 J.
binding region in the Escherichia coli processing endoribonuclease RNase E. J. Biol. Escherichia coli RNA degradosome. Genes Dev. 12: 2770-2781.
of the 5' end of 16S rRNA. Biochem. Biophys. Res. Commun. 259: 483-488. RNase E from growth arrest by modulating the ribonucleolytic activity. Biochem. Biophys. Res. Commun. 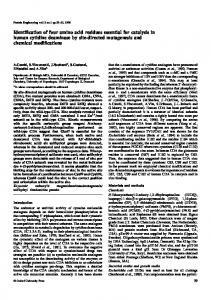 345: 1372-1376.
containing 10-1,000 µM IPTG for their ability to support the growth of KSL2000 cells. here, were electrophoresed in 0.9% agarose gel and stained with ethidium bromide. RNA molecule. Percent precursors were calculated as previously described (24). 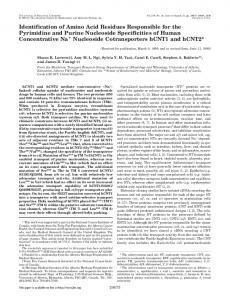 ribonucleolytic activity of N-Rne mutants in the cell. transferred to a nitrocellulose membrane and probed with monoclonal antibodies to Rne. proteins of N-Rne and N-Rne-L385P were used to measure CD spectrum. 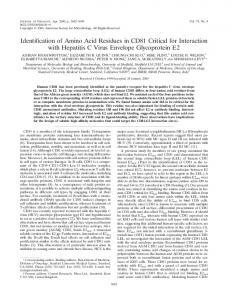 Report "Identification of amino acid residues in the catalytic domain ... - Genetics"